Players will be able to take characters they have customized in the 3DS version and transfer them to the Wii U version. The Wii U and 3DS versions of Nintendo's upcoming mascot fighter: Super Smash Bros. will be different. While the number of characters will be the same between versions, each version will feature different stages and of course, different graphics. Game Director Masahiro Sakurai stated in the past that he was working on some kind of cross-platform interaction, but unfortunately, it isn't cross-platform play. 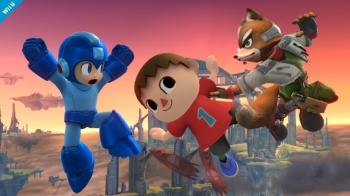 "Since each version of the game has completely different stages, cross-platform play wouldn't work," Sakurai told Joystiq through an interpreter. He did, however, tell us that players will be able to take characters they've customized in the 3DS version and transfer them to the Wii U version. Sakurai wouldn't go more specifically into these what these "customizations" would be, but stated that they would not be custom costumes, as he feels they would take away from what makes each character unique. He also wants to avoid boring, repetitive tasks, such as having to collect collectibles, while developer Sora works to produce a "stress free, easy connectivity" between the two versions. When asked if the level editor would return, Sakurai simply said "no comment." In previous versions of Super Smash Bros., players were able to customize their character by assigning them custom control schemes and names. I'm sure veteran Smash players would welcome the opportunity just to be able to transfer their control scheme to a friend's or tournament's console via their 3DS. As for other customizations, if it's not costumes, what else could it be? Mega Man was shown to have quite a large number of abilities, could characters possibly have customizable ability loadouts?